Having just wrote the last post, I am inspired to take a walk out the trail. I think to bring my camera, but instead my stomach distracts me and I carry only a tasty smoothie in a plastic cup. The thought is that the walk might put focus into a mindful slurping on the fruity nectar. I stop every so often from watching my step, to a pause in the trail, observing my surroundings. There is a more overcast sky today, the temperature is very comfortable, no heat from the sun. 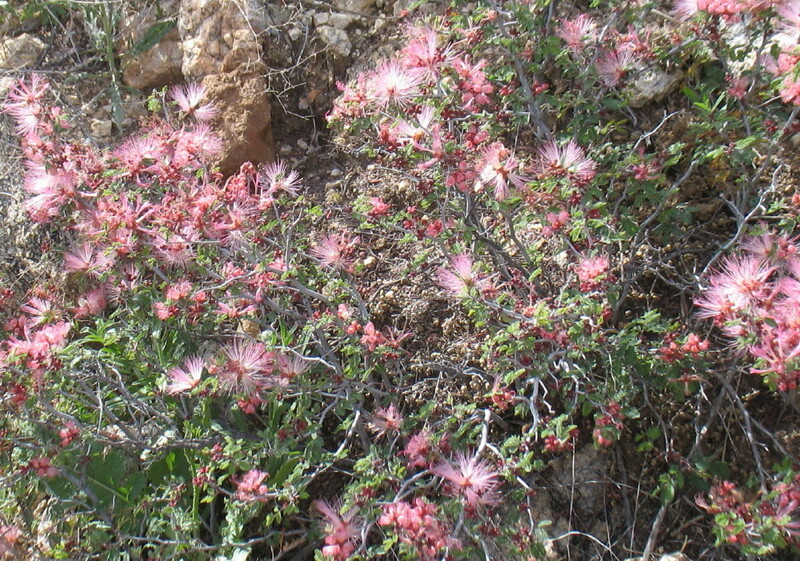 The whispy pink fairy dusters are scattered among the rocks. In the distance, the hills are lit up, coated in yellow with the flowering of paloverde and sage. The grey sky brings out a different tint to the vegetation. Grey is more grey. It appears in many shades. The grey-green plants stand out bright in contrast. There are patches of rabbit raisins in the trail. They seem to be large rabbits. Each stop that I take, just to notice what is there, is delightful. Mostly, nothing man-made is to be seen. There is no sound of vehicles, nor voices, only the occasional breeze, the buzz of the bees which are coming out more and more, a fly. Every so often there is a startling noise of a disturbed lizard, or bird in the brush near the trail. It’s quiet. I reached the top of the crest and as I step onto the boulder bridge to THE rock, there is an alarming loud jolt of sound. This wasn’t the little lizards, nor a flock of turtle doves, it was big noise. The javelina had come back to nest directly under THE rock. I freeze. Three show themselves. They begin to stand sniffing and listening. The one closest appears to be quite on edge. I stand still on a rock. This closest one is about 20 feet away. They get testy at times, protecting young. They seem nearly blind. I slurp my smoothie watching the entertainment. A very young one tip toes across my view. They are incredibly cute when they are so young. Behind me, where I can see next to THE rock, is a female looking at me. She seems less aggressive. There is something female about her. Maybe she is in a mother’s nurturing mode, but she is looking my way, watching. I begin to feel a bit guilty. I’m intruding. I would have loved to have spent all afternoon on top of THE rock with them right below. I figure that the less that I disturb them, the more likely that they will stay around. That seems to be the appeal of this little valley, or hollow. It is safe from man. I have seen them heading in this direction in the past, from the jeep trail. It is probably a regular habitation. I turn to leave; the female reacts as I move. She has been waiting to react to what I do. It was okay as long as I didn’t move. Everyone is on alert. On my way back, I consider how to do a Jane Goodall and be accepted around the tribe. What would change the usual dynamic? I thought of the most valuable commodity in the region. I have a wealth of water. Could I somehow buy my way in, just as an observer, a safe being, non-threatening, the naked one, different from the other humans. Maybe not even human. Perhaps this tale will unfold. They will decide if the neighborhood smells too weird and threatening. “There goes the neighborhood,” Father pig said. “Did you smell that weird beast? Yech!” Well, I don’t smell like laundry. I will make a point to bring a camera with me, for now.